SAN ANTONIO -- A former Texas nurse who prosecutors say may be responsible for the deaths of up to 60 young children was indicted Wednesday on a murder charge for the second time in recent weeks. The Bexar County district attorney's office said in a statement that Genene Jones was charged in the September 1981 death of 2-year-old Rosemary Vega. She was charged with a separate count of murder last month in the death of an 11-month-old boy. Jones, 66, is serving concurrent 99-year and 60-year sentences in state prison for the 1982 killing of another toddler and the sickening of a 4-week-old boy who survived. But she was scheduled to be released in March 2018 under a mandatory release law in place when she was convicted. During Jones' time working at a San Antonio hospital and elsewhere in Texas, children died of unexplained seizures and other complications. District Attorney Nico LaHood previously said investigators believe Jones may have killed some or all of those children because they died under unusual circumstances during or shortly after her shifts. 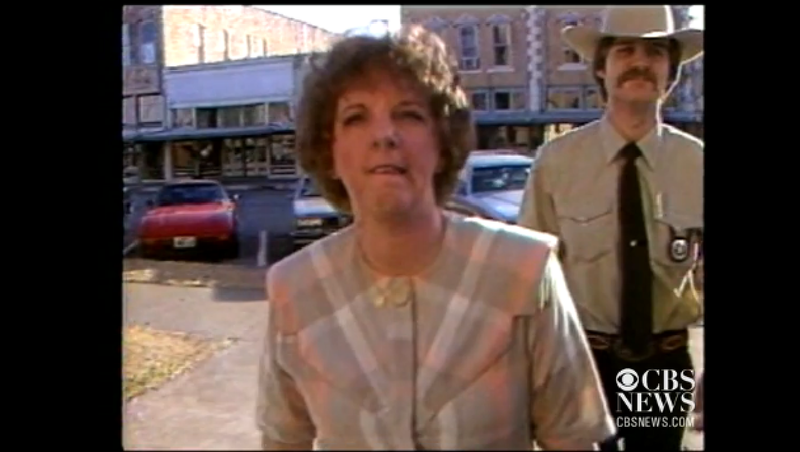 "I believe Genene Jones is an evil woman. I think her conscience is seared. I don't think she looks at the world the way we do," LaHood said at a previous press conference, reports CBS affiliate KENS. The 11-month-old boy died of a fatal overdose of an anti-seizure drug, Dilantin, and prosecutors at Jones' 1984 murder trial said the nurse lethally injected children at a clinic in Kerrville, northwest of San Antonio, to demonstrate the need for a pediatric intensive care unit at a nearby hospital. Other prosecutors theorized that Jones' tactic was to take swift medical action and save some of her victims, making herself appear to be a sort of miracle worker. It's not clear why Jones' actions, involving so many suspected victims, were not detected earlier. But Sam Millsap, a previous district attorney in Bexar County, told KSAT-TV in 2013 that medical records at the San Antonio hospital at one point were accidently destroyed, hampering efforts by investigators to prove their suspicions. She received a letter of recommendation in 1982 from the hospital that described her as "loyal, dependable and trustworthy," according to a report jointly published by Texas Monthly and Pro Publica. Jones has reportedly been called the "killer nurse." Her case has been chronicled in two books, a TV movie and numerous articles. She has maintained her innocence. It's not clear if she has an attorney to address the most recent allegations against her. LaHood told The Associated Press after Jones was charged with murder in May that the charge was based on fresh evidence that came to light and a review of old evidence. He also said the deaths of some of the other children were being re-examined and that additional charges could be coming. "Our focus is to hold Genene Jones accountable for as many children's deaths as the evidence supports," LaHood said Wednesday. LaHood said news of the indictments was "surreal" for the parents of the two children in whose deaths Jones is most recently accused. "It's bittersweet, because they've been cheated out of a life with their precious baby," LaHood said. "But they're hoping she will be held accountable." Jones is currently incarcerated in the Texas Department of Criminal Justice Lane Murray Unit in Gatesville, Texas, KENS reports. Prior to her March 2018 mandatory release, she is expected to be extradited back to Bexar County where she will await trial for the new charges. "These indictments are just, but also they're timely as well," LaHood said. The grand jury recommended Jones' bond be set at $1 million on the latest indictment.